Isiklar Paper Sack Co.Ltd. has been founded in 2011 in Arbil to manufacture and sell paper sacks to mainly cement industry in Iraq and other industries like construction chemicals, lime, minerals and others. Isiklar Paper Sack Co. Ltd. is owned by Isiklar Ambalaj Pazarlama A.S. which is a subsidiary of Isiklar Energy and Yapi Holding, publicly traded in Istanbul stock exchange market (BIST), which started its activities in 2008 with the objective to establish industrial facilities in Middle East countries and mainly in Iraq and manufacture industrial goods. Isiklar Paper Sack Co.Ltd. has its Head Office in Arbil and the plant has been located on Makhmoor Street only 9 km away from the Arbil City Center. The factory has been established on a 30.000m2 land, and the covered area has been 5.000m2 as a start up phase and planned to reach 12.000 m2 covered area in 4 years as the business grows further. Factory is the latest Greenfield Plant in the industry operating with W&H state of the art machinery manufactured in Germany. 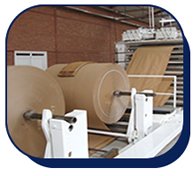 The starting production capacity is 80 millions units of kraft paper sacks and has been planned to reach 240 million in 4 years time. Iraq has always been an important export market of Isiklar Ambalaj Pazarlama A.S. which has been founded in 1972 in Bartın as the first kraft paper sack manufacturer in Turkey and which is the major shareholder of the Işıklar Paper Sack Co Ltd. Now with the new investment in Arbil Işıklar Group has been a local player and an industrial investor. The construction of the factory building has been completed, the machinery has been installed, the organization has been set up and the production has started as of March 2013. Isiklar Paper Sack Co.Ltd. has been one of the first major industrial investments in Arbil area.